For this week's cocktail, I wanted to use up the rest of the rosemary syrup I made for the Ruby Rosemary with a cocktail that would have more subtle, herbal flavors. I knew gin had to be the base spirit and selected Bombay Sapphire for its woodsy, floral notes. St. Germaine is a bit floral too and reminiscent of grapefruit. Both of which showcased the rosemary better than the Ruby Rosemary, even though there's only half a shot of it in here. I named it the Gin Sprig in honor of the spirit and the herb. 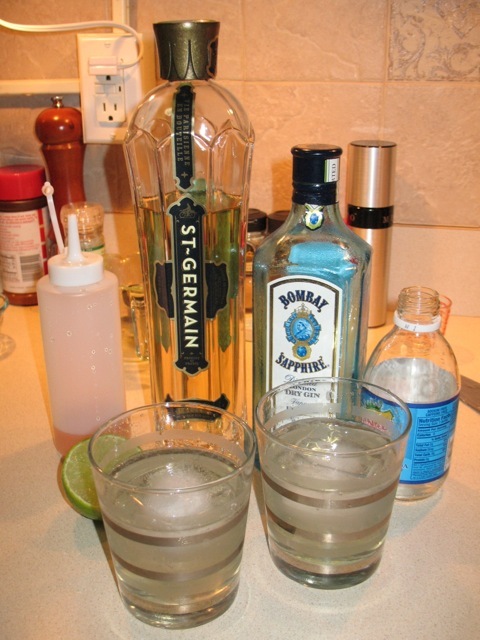 Combine gin, St. Germaine, rosemary syrup and lime juice in rocks glass with ice. Top with club soda and stir. *To make rosemary syrup, roughly chop about 2 tablespoons of fresh rosemary add to saucepan with 3/4 cup water and 3/4 sugar. Bring mixture to boil, remove from heat and steep for 10 minutes. Strain syrup to remove rosemary. Keep syrup in refrigerator. I could really use one of these. Like, right now.